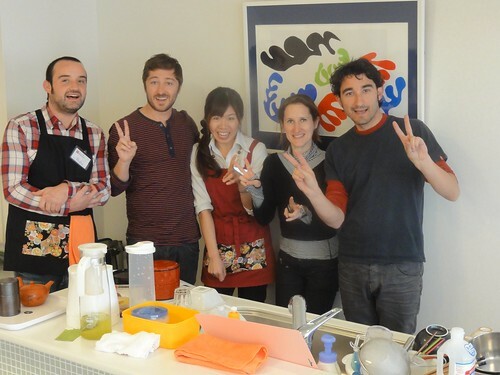 Today we held " Learn basic Japanese cooking lesson " with four guests. 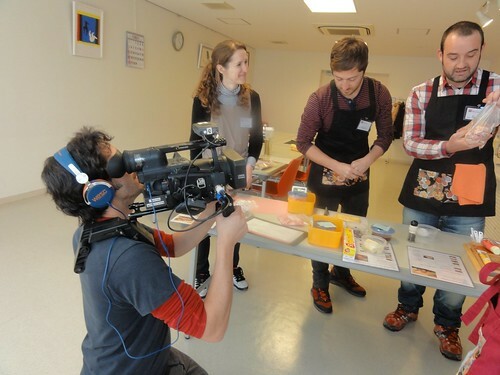 I got some kindly comments from them about impressions for Nagomi Kitchen's cooking lesson. from Pedro: The kitchen is very nice. Very spacious, charm, lovely place. Megumi is a very kind & lovely person and her mum is also very kind. They are both very funny. from Pablo: So friendly people and so tasty food that I want to settle in this kitchen forever! from Deanna: Really friendly, food is really good! Thanks a lot. It was two years ago when I first realized the amazing variety of soy sauce brands that were available in Japan. 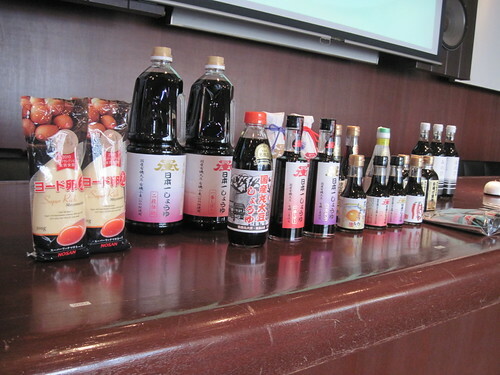 I attended a soy sauce tasting event similar to a wine tasting where you would learn about the people and regions where the soy sauce was made and how best to use it in your cooking. I had seen the extensive selection of soy sauce in my local supermarket in Tokyo before attending this event but actually sampling the different soy sauce and tasting the difference, I finally started to view individual soy sauce like microbrews and wanted to continue trying more. Discovering these differences in flavors within basic Japanese ingredients such as soy sauce has been an exciting process for me having grown up in a Japanese family living in Texas where Kikkoman soy sauce was the most accessible product out there. Although there is nothing wrong with sticking to Kikkoman since it is the most popular Japanese soy sauce around, it is great to know that I have other options making Japanese cooking that much more exciting to experiment with. While there are many other soy sauce brands around the world, it would definitely be nice if everyone could try more Japan made soy sauces if they are looking for something to use in their Japanese cooking. I’ve also been trying a variety of Japanese mirin, dashi, and even salts and sugars and it is exciting how each distinct brand has a different nuanced flavor making my food come out different every time. So make sure to visit a supermarket next time you come to Japan and if you have any questions about products that are sold in the supermarket feel free to ask us at Nagomi Kitchen. Yesterday I went to a friends house and was surprised that she served miso soup with fresh ginger. Being a fan of all things ginger, I searched around on the internet both in Japanese and English for similar recipes. Although it wasn’t one of the most popular ingredients when it comes to miso soup, there seemed to be quite a few fans out there that liked it most during the wintertime to warm up. Seemed like a logical combination but I guess it just never crossed my mind to try it out. It’s little discoveries like these that make miso soup exciting. A soup that seems so simple and straight forward has so much potential. Miso soup is a staple menu in Japanese restaurant’s worldwide but I always feel that there is something lacking in them. Yes there are restaurants that get it right of course, but often times it just tastes like hot water with just miso and no depth. But I think what makes them less exciting is that there is not much variety when it comes to the actual ingredients inside the miso soup. It’s always tiny pieces of tofu, wakame seaweed, and maybe some green onions. But don’t get me wrong, having tofu and wakame is not the problem. It’s the most basic yet most popular ingredient for miso soup. It’s just that even if you are just making this basic miso soup, I feel like not many people realize there is still a lot of room for creativity. You can just start from using different types of tofu. Of course you can choose between the basic hard or soft tofu but different brands have different flavors, especially fresh tofu, so it’s best to try all of them out. You can also cut the tofu into small pieces or large depending on what you put in with the tofu. There is also of course the option of using different dashi soup stock. I suppose its best to make your own dashi from scratch but for everyday miso soup I use an ago flying fish dashi packet that looks like a tea bag because I personally like the more nuanced flavors that come from this dashi than when I use the popular Ajinomoto Hondashi. But that doesn’t mean you can’t make a pretty good miso soup with Hondashi so I don’t want people to knock it since it is the most accessible instant dashi out there. I think the key is to make sure that the flavors from your ingredients become part of the broth, adding more depth. That’s where the ingredients play a big role in making the flavor in your miso soup unique. Besides tofu, I like potatoes in my miso soup with wakame but my husband is more of a daikon radish or taro fan which makes the soup base sweeter. Onions and cabbage are also options that make the soup base sweeter. An alternative to normal tofu would be fried tofu which is less oily than it sounds so it is one of my favorites. There are also all sorts of mushrooms in Japan so whichever one is the cheapest on that day usually ends up in our miso soups. The tonjiru pork base miso soup that is part of the Nagomi Kitchen Japanese basic cooking class menu, although the dish has it’s own name, it really is a variation of miso soup. Since tonjiru has a lot of ingredients in it, we’re hoping it will help people to taste how all these ingredients blend with the miso, to get a sense of the potential miso soup has beyond your normal tofu, wakame, and green onion combination. Even after you’ve done making the miso soup, there is also the option of putting a dash of shichimi chilli pepper just before you eat if you’re a fan of spice like me. So as you can tell, the combinations are endless so next time you are craving some miso soup, try these options out to break away from your normal miso soup cycle. Or if you are planning on joining us at Nagomi Kitchen, feel free to ask us questions because that's what we're here for! This is the simmered vegetables which called as Nimono（煮物）in Japanese. 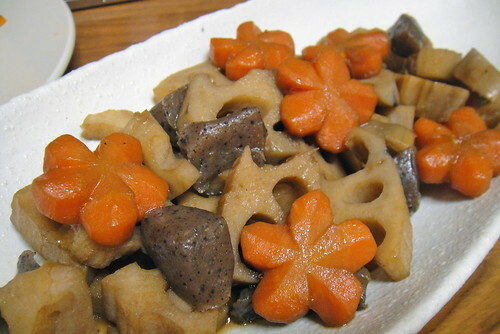 Simmer carrot, lotus root, “Konnyaku” and any other vegetables with soy sauce, mirin and Sake. Sometimes we add the chicken in it as well. The taste of these kind of Nimono depends on each home. 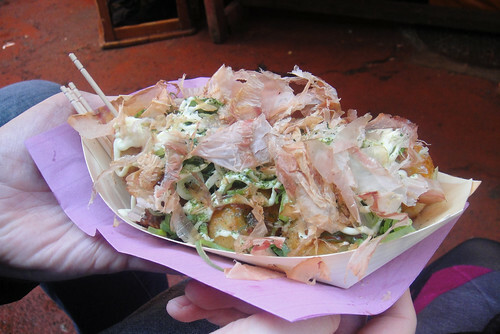 Takoyaki is one of my favorite Japanese food and I think a lot of Japanese people like it! 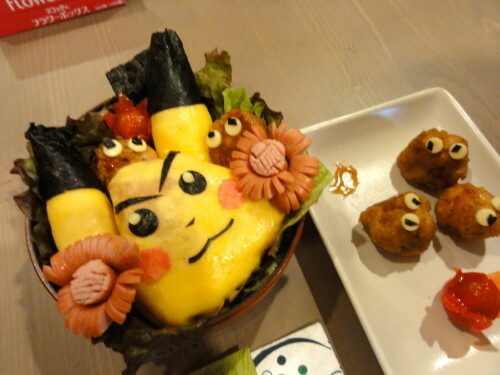 It's a grilled octopus balls. Mix flour, eggs and water (sometimes use dashi stock) then fry it in the special pan, put the boiled octopus and keep turning them until they are round shapes. Place it on plate, and pour the Takoyaki sauce, mayonnaise, seaweed powder and bonito flakes. If you go to Osaka, you can easy to find Takoyaki shop and get it approx. 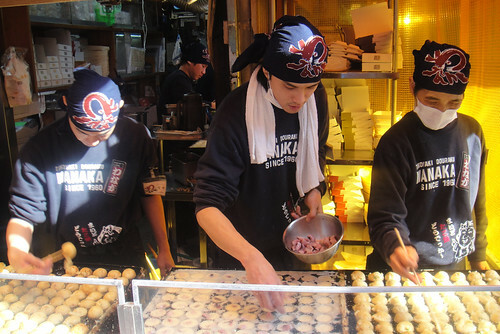 6-8 Takoyaki balls for 500 yen. 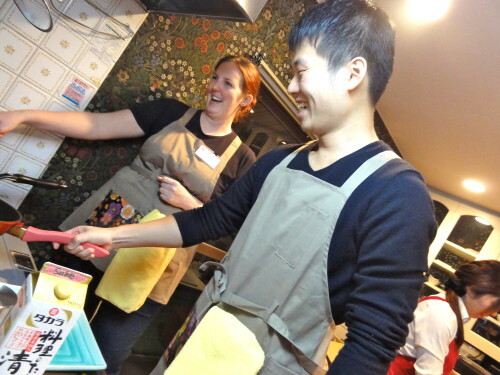 If you are interested in trying Takoyaki, join home visit program and visit Adachi family :) Now they live in Tokyo but originally come from Osaka, so you can enjoy real home-made Takoyaki with them! 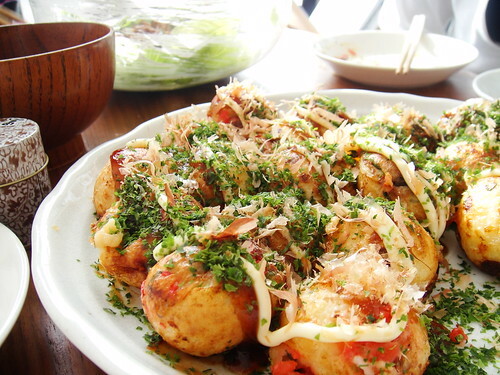 They will tell you some tips how to make delicious Takoyaki! 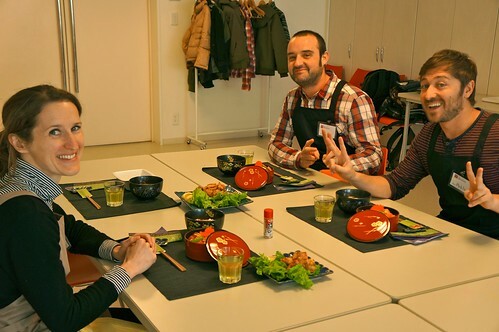 Not only will you be able to explore new dishes, home visit program will be a fantastic opportunity to have a meaningful cultural exchange or practice your Japanese skills. Think of it as a short home-stay program for those who do not have the time but still want the experience. There are families that welcome visitors during the day at lunch too so check through your schedule to see if you can find some time for a nice Home Visit. If you would like to join, contact us via each host family's page two weeks before your desired visiting date and we will arrange your visit to host family. 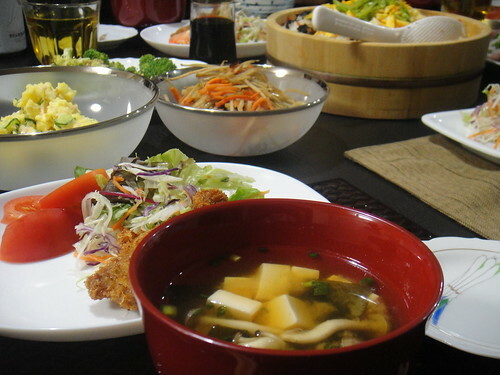 Adachi family can welcome you on Saturdays or Sundays for lunch! 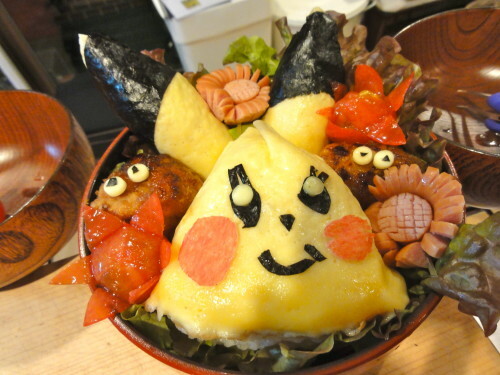 In Japan people eat traditional meal on new year days. This meal called as Osechi and it's variety kind of dishes and serves in a bento-box style plate. 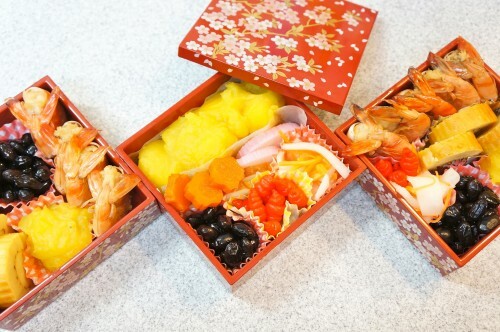 People eat this Osechi with family and friends to celebrate new year. I cooked Osechi for this year! We can also buy Osechi at department store, supermarket or even via internet in these days but I tried to cook it with my sister on 31st Dec. I love this sweet omlet very much! Originally my grand mother bought us a special Datemaki every year so my favorite taste of Datemaki is not a homemade but I wanted to try to cook by myself. 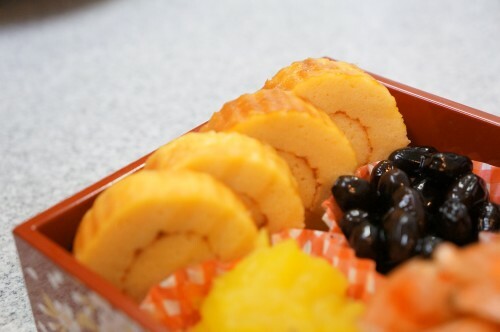 All menu for Osechi has meaning and shrimp meaning "live a long time" because hip of shrimp stoop such as old man. Kurikinton is my favorite Osechi menu as well. My mother made it every year when I was child :) This is the sweet potato colored with brilliant yellow and put in some chestnut. From this time we prepared apron for each participants. 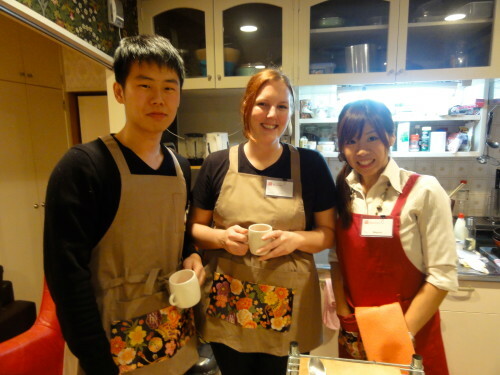 The color is beige and black and the Japanese taste pattern on the pockets.So you don't have to bring anything when join our cooking program! Second step was making the character, it's a main event of the program :)I have a sample but participants can make it as absolutely original face with Nori seaweed. 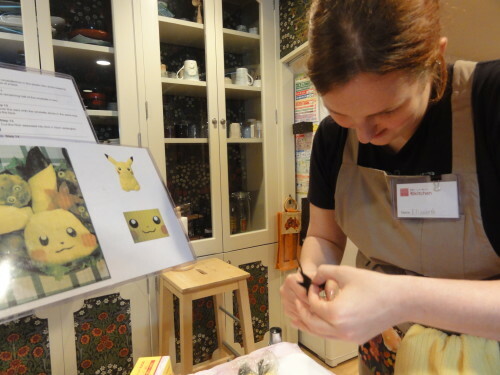 Elizabeth made a eyebrow of Picachu, it's a very manlike ;) Nice!